Seal killing has long been a serious animal welfare issue in Scotland, but it’s now threatening to become an economic and reputational issue too. The USA has introduced a ruling to ban imports with lower marine mammal protection standards than their own. It says that to export to the US, nations must implement a regulatory program that prohibits the intentional killing or serious injury of marine mammals in all fisheries. It’s hard to see how the licensed killing of 1500 seals complies with this, suggesting that Scottish salmon producers may not be allowed into this lucrative market until they clean up their act. With salmon exports to the US worth over £213mn in 2014, the stakes are high. In the last five years over 1500 seals have been shot dead in Scottish waters to protect salmon farms and netting stations. New evidence shows that this is causing serious suffering, with pregnant and lactating seals are being killed, and some seals are being injured and suffering prolonged deaths. Incredibly, things are actually a lot better than they used to be. The number of seals killed in Scottish waters is in steep decline largely thanks to the seal licensing system that was introduced in 2011 following a major campaign by OneKind and other animal charities. Our aim had been a complete end to shooting altogether, so we didn’t get everything we wanted but the system has saved thousands of seals. Prior to the licensing system it was estimated that about 1500 seals were being shot a year. In 2015 this had been reduced to 160. That’s 1340 lives saved last year alone- or 6000 in total since 2011. An incredible achievement that should be celebrated, but with so many still killed each year, and new research showing that this is causing serious suffering, we believe it’s time to finish the job. Seals are killed by fishermen, salmon farms and netting stations. These are large nets positioned in sites like estuaries to catch highly valued wild salmon. The industry argue that seals can cause serious damage to their operations and can have negative impacts on the welfare of the fish they kill. They also claim that killing is a “last resort”; a requirement of the license system. When a seal is killed, the license holder should retrieve the carcass for post-mortem if it’s safe to do so. Unfortunately, this is happening in only a fraction of cases. However, new research and the release of post-mortem data from the Scottish Government is enough to tell us that seals are suffering as a result of licensed killing. Seals are being shot whilst in the water – The vast majority of seals appear to be shot whilst in the water. This has a high risk of causing injury and a prolonged death, with one study concluding that “shooting seals in open water can never be humane”. Pregnant seals are being shot – 35% of the shot seals that had a post-mortem were pregnant. If this is indicative of the wider situation, approximately 500 pregnant seals would have been shot between 2011 and 2015. Lactating seals are being shot, leaving dependant pups to die – Seals can be shot at any time of the year in Scotland, and the data shows that gray and common seals are being shot during the periods when pups are born and are dependent on their mothers. Any orphaned pup would starve to death. 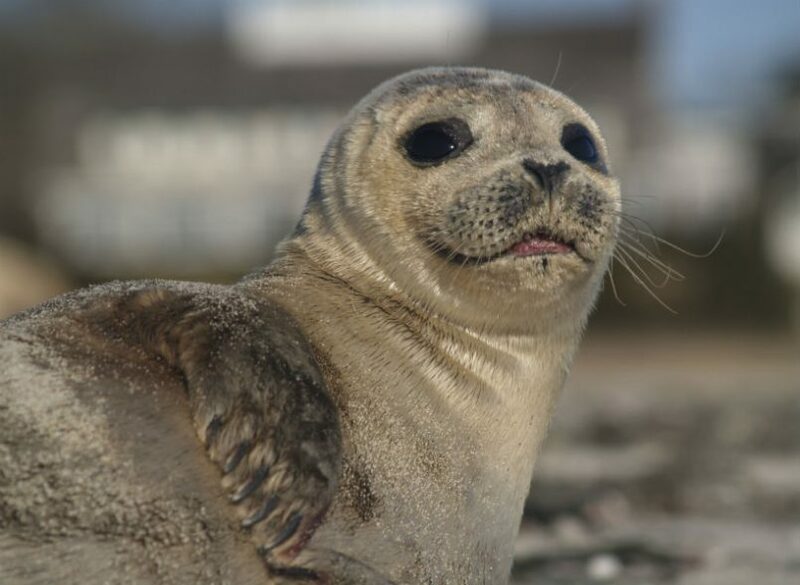 Some seals are suffering injuries and prolonged deaths – Even with a relatively small number of post-mortems, a significant number of injuries and prolonged deaths were detected. This includes multiple gunshot wounds and blood aspiration, which suggested that they had not been killed by the first shot, a seal shot in the neck, and another through the mandible, both of which are unlikely to be immediately fatal. Whilst this amounts to a shocking catalogue of suffering, there is hope. Licensing has driven a big reduction in seal killing, forcing the industry to develop new practices and technologies that keep the seals at bay. Some of these are common sense, such as properly tensioned and thicker nets that prevent seal access. Other more innovative solutions have also come forward. Acoustic deterrents, for example, are now widely used and are getting more effective all the time, whilst seal blinds prevent seals from seeing the fish in the farms. In effect, the licensing system has proved that seal killing is unnecessary. And, with non-lethal alternatives improving every year, we believe it’s time to commit to zero seal kills. We are also calling for a closed season to be introduced immediately so that pupping mothers cannot be shot. In the end, we believe a fundamental shift in attitudes is needed. The seas are not ours to exploit; we have to share them with the rest of the animal kingdom. Salmon farm operators and fishermen are operating in the seals’ habitat, not the other way round. 1. Don’t eat salmon. Alone this won’t stop the killing, but it means you won’t accidentally be part of the problem. 2. Write to retailers and ask them to demand their suppliers commit to zero seal kills. Please email us at info@onekind.org for contact details and to let us know if you do this.